You don’t have to be Michelangelo to paint a ceiling. Admittedly, it might help if you’re attempting something along the lines of the Sistine Chapel, but if you just want a couple of coats of emulsion, it’s definitely something you can tackle yourself. If the idea of painting above your head makes your shoulders ache, you can find an endorsed painter & decorator with Which? Trusted Traders to take it on for you. The best paint for ceilings is a simple matt emulsion. 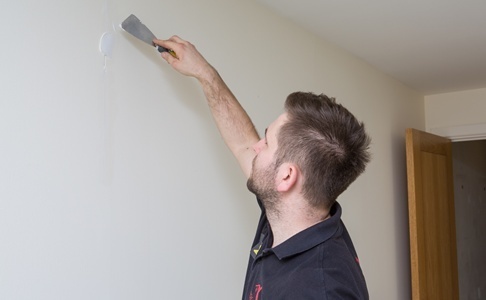 Specialist ceiling paints do exist – they’re formulated to avoid spatter and dry slowly – but a simple white matt emulsion is fine for most jobs. Check our article on cleaning your paint brushes and rollers to keep your tools in top condition. Read on for more tips to ensure a smooth finish for your ceiling. You’ll need to clear and cover the area to avoid damage from drips or spatters. 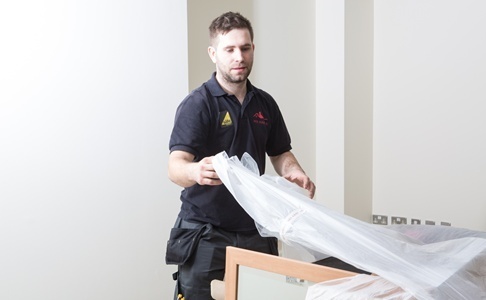 Remove as much of your furniture and ornaments as possible from the room, then cover the floor and anything you can’t move with dust sheets or protective plastic. 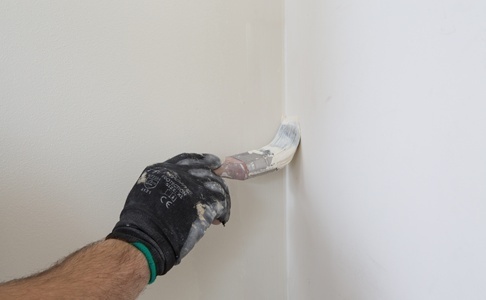 If you’re planning to protect areas you don’t want painting with masking tape, use the best tape you can afford, and be aware that it may still allow some paint underneath. An alternative is a painting shield, which costs about £5 and can be reused. You hold the shield with one hand to mask an area, while you paint with the other hand. Planning and preparation is the secret to a professional finish when painting. With any decorating project, you start at the top and work your way down, so always work on the ceiling first. Start by scraping away any flaking paint or other lumps. Fill any large holes or cracks with a suitable filler product. If there are stains on the surfaces, such as grease or watermarks, these need treating with a shellac-based stain blocker product to seal them in, before you start painting. For hairline cracks in the ceilings or walls use a knife or old screwdriver to enlarge the crack slightly before filling. Giving the filler more space means it won’t fall out as it dries. If you need to deal with a hairline crack in a corner or around woodwork, use a cartridge gun to apply decorative caulk (not silicone). Squeeze it into the gap and carefully smooth it with a wet finger or sponge. Allow it to dry according to the manufacturer’s instructions – you can overpaint most varieties within an hour. All surfaces must be clean, dust-free, and completely dry before you start. Cover any light fittings in the ceiling with low-tack masking tape to keep them free from paint. If you’re planning to paint the walls next, you may want to cover the wall fittings at this stage, too. Once the walls are ready you can prepare the paint. Dilute the paint with water or commercial thinner by 10% to reduce the ‘orange peel’ effect left by rollers. Use a medium pile roller, with a telescopic roller pole, that holds enough paint to cover a large area at a time. Work across the width of the room for the first coat and along the length of the room for the second, working away from the direction of the light. Always leave four hours between coats to avoid peeling in the future. Ensure you keep a wet paint edge while you are working, otherwise you will get a ‘shut’, which is a line created where you overlap and have let the leading edge dry. This means that once you start, you cannot stop until the wall or ceiling is completed. 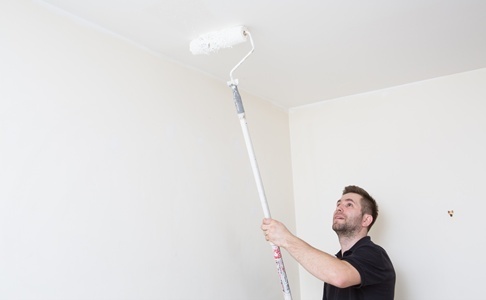 If the ceiling starts peeling then stop painting, as the roller will cause more damage and deposit the peeled paint onto other area which will ruin all your hard work. You will need to paint the ceiling with specialist anti-peel paint before reapplying the top coat. Always cut in (paint the areas that are too tight for large rollers) while the ceiling is still wet. You can quickly get around the ceiling edges using a 2-inch brush or a mini roller – a small step or ‘hop up’ will help with this. Try to avoid getting paint down the walls, even if you are going to paint them afterwards as the white ceiling paint may ‘flash’ through the new wall colours. Allow the paint to dry before removing any masking tape from around fittings. 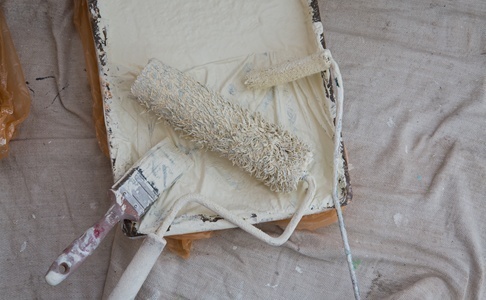 If you’re working with newly plastered ceiling or walls, or you’ve filled any holes, start by painting a mist coat. A mist coat is a matt emulsion, thinned right down with water or a commercial thinner, to seal the surface and provide a strong base for the top coat of paint to stick to. Never use emulsions with vinyl for a mist coat. You can buy paints designed for new plaster if you don't fancy mixing your own. The mist coat will reveal smaller imperfections that you can tackle with filler and sand flat. You may need more than one coat to cover the wall evenly. It is a good idea to do a mist coat under any strong colour change, particularly if you are going over reds or blues. If you needed a mist coat, wait for it to dry before applying the first coat. Check the manufacturer's guidelines for ventilation, drying time and other instructions and once again thin the paint slightly. Paint with vinyl in it is more durable and preferable for heavy-use areas. Apply at least two coats – several light coats of paint are usually better than one heavy one. Painting in daylight will help you to avoid getting a patchy finish. Once again, roll the main body of the wall first. Use a paint tray and apply the roller with gentle, steady pressure. Be careful not to overload it. When the roller stops sounding 'wet', reload it with paint. Roll one wall then cut it in whilst it is wet before proceeding to the next wall. Start at the top and work your way down. Begin by 'cutting in' (using a paint brush to cover the areas that are too tight for rollers) at the ceiling line, painting each wall methodically. Use firm, horizontal strokes in line with the ceiling for a straight line. If you're working on a vertical join, you may find it easier to rotate the brush to paint with the narrow side. If you’ve used masking tape, peel this off gently while the wall is still wet before starting on the next wall. If paint seeps through the tape, wipe away with a damp cloth. If you’d rather a professional painter and decorator took the strain, Which? Trusted Traders has accredited traders in your area.